Paul Pilon has over 20 years of greenhouse growing experience, where he produced annuals, potted plants, plugs, and perennials. He received a Bachelor's degree in horticulture from Michigan State University in 1993. During the last seven years, he has specialized in the scheduling, growing, and research of perennial crops. As a perennial grower, he also became an educator and a respected source of cultural information. Paul has written articles for numerous trade magazines including GMPro, Greenhouse Grower, and Grower Talks. He has contributed a monthly column, "Perennial Solutions" in GPN for nearly four years. We have placed links to all the articles that Paul has written for GPN over the years. To view these links see Paul's Articles. Paul has traveled across the USA and abroad to give presentations to growers on various production topics. His passion for plants and desire to help others has led Paul to author a book "Perennial Solutions: A Growers Guide to Perennial Production" available from Ball Publishing. 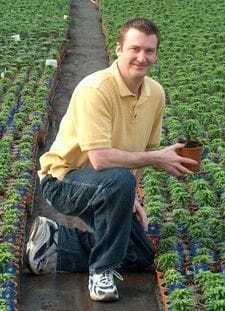 Most recently he started a consulting company, "Perennial Solutions Consulting", and works closely with growers across the country, offering customized services to address their needs. 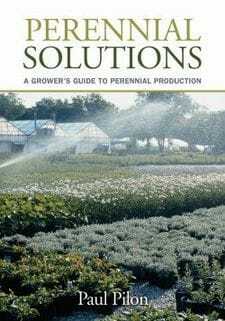 "Perennial Solutions - Growers Guide to Perennial Production"
Over 500 pages covering all aspects of commercial perennial production. Applying up-to-date technical and cultural information to the everyday production of perennial crops, this guide is specifically devoted to producing perennials under greenhouse and nursery conditions. The back-to-basics approach gives growers an understanding of the principles behind production practices, enhancing their ability to consistently provide high-quality perennials to the marketplace. A guide to propagation and growing plants to maturity with chapters on media, water quality, fertilization, insect and disease management, weed control, plant growth regulators, forced blooming, and production schedules for more many of today's most popular perennial species provide growers with everything they need to succeed.